Life is a constant balancing act. Have you noticed? The pieces are never perfectly in place. They’re always moving. Always changing. Circumstances are always evolving. We are always adapting. This can be really frustrating if we haven’t accepted the fact that life is always moving and will never be perfect. I’ve been working through learning balance myself, hence the immense delay and clog of the virtual keyboard airwaves that has left you all in silence the past few weeks. 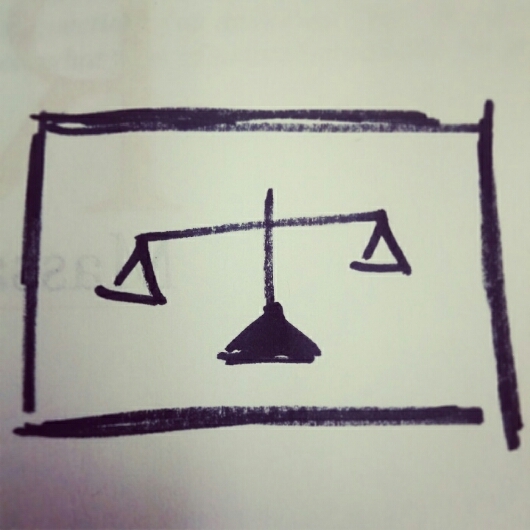 Here’s what I’ve learned about balance: I’ll always be learning about balance. Like I said above, it is always evolving. I can offer, however, some guidelines, a sort of “trail map” if you will, to navigating your journey to balance in life. We have spoken of [VISION] and [DILIGENCE]. Go back to the VISION and let’s make a list. Stephen Covey had a great concept in his book, 7 Habits of Highly Effective People. The concept takes your to do list and helps you to properly and most effectively prioritize it. I have 5 key areas of my life with goals. + Family – have great relationships with family and significant other. + Fitness – Drop body fat 5%. NY Marathon. + Social – have a group of friends unrelated to work or business that share like values and always have one another’s back. I break those goals into action steps. Now, I covered all of this in DILIGENCE. This should not be new info. Now comes the magic. WHAT TO DO FIRST? I already prioritized my list above. Family is first, then business/ministry, personal fitness and personal development and social areas kind of flow with one another for me. I have been seeking out and recognizing patterns in my life as far as my calendar and circumstances go, so I have learned that, for me, sometimes I have more time and opportunity for social interaction and development than others. Maybe one week I find that its possible to catch up with everyone. Then, the weeks that I cannot, time affords me the opportunity to train my body more or my mind and personal development more.